Here I am sitting at Starbucks in Nassau, Bahamas! We had a lot of bumps along the path, thank you Rachael for saving our behinds. Aiden of course is getting so much attention. You would think people haven't seen a smiling baby before, well probably not as cute as ours. 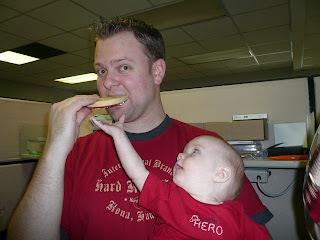 (Hey, it's my blog, you can say your kid is the cutest on your blog). Everybody, I mean everybody stops us to say hi to Aiden and touch him and hold him, the security guard on our way out of the ship today, looked at our ID cards and then took Aiden from Josh to hold him, didn't care that he was holding up the line to get out, he wanted to hold our cute boy. Aiden had a fun little play date with Kiana on the cruise. They have a baby/toddler group every morning, but it was just the 2 of them. We are getting ready to go play with the Dolphins. Again, Jealous Much? 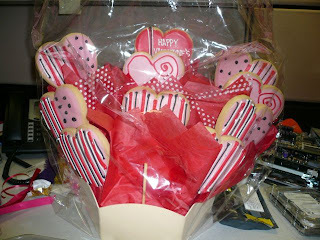 This is what Josh send me for Valentines Day, only Larger. This picture is of the medium size, I got the Big one. I ate plenty. You should have seen how quickly he ripped that thing out of Josh's hand. We had a Great Valentines Day! We are very blessed to have so much love in our lives. Josh took me on my Valentines date early. We thought he was going to be out of town that day. He surprised me and took me somewhere I have been wanting to go my entire life. 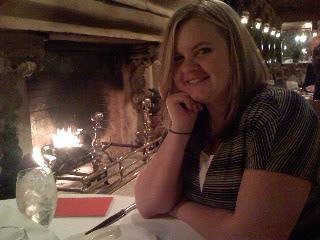 We went to La Caille. It was crazy fancy. 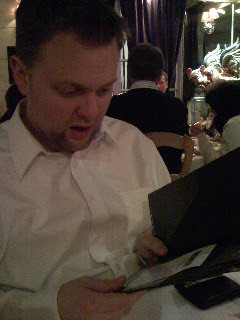 When we sat down I went to put the white napkin on my lap and the hostess made me give it to her so she could give me a black one since I was wearing black pants. Pardon the pictures they were taken with the camera on the phone. I don't know what is funnier here. 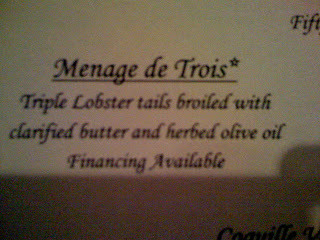 The title of the entree or the fact that it costs so much they finance it. 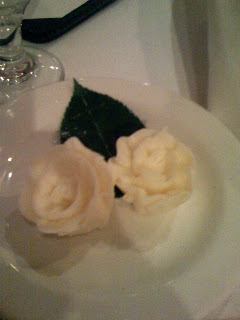 The butter was shaped like roses. Here are the yummy free treats they brought with the bill. Probably to soften the blow. I was afraid I was going to be mighty disappointed. Waiting so long for someone to take me there, me being such a picky eater. and it being so pricey, well personally I thought it was totally worth it. 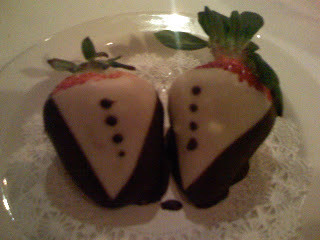 The fancy schmancy food was delicious. Truly tasty. Best steak I have ever had, including at Spencers. I even ate cavier. That was kinda gross. At first I felt akward and like I was going to make a fool out of myself. Then I thought screw it, you pay this much you can eat however you want. I grew up in a very pet friendly house. Over the years we had it all, dogs, cats, snakes, turtle, birds, bunny, and so on. There was however one restriction, absolutely NO rodents (this includes cute hamsters). So I personally do not care for rodents. Except for one; Meet Timbleton. The last few pictures starting with Bella is the day we gave him away. Thinking that would be the last time we saw Timbleton. The story of Timbleton. I had a pet snake. He loved to eat little mice. One day I went to the pet store to get his food and they were out of mice. I got a baby rat instead, barely had his eyes open. Same size, apparently not same great taste. The baby rat was put in the snake cage and ignored. Night time fell, and the baby rat was cold, he was used to having tonz of other rats to keep him warm. So he decided to snuggle the snake. (wish we had a picture). The snake was annoyed and would move away from him, but still not eat him. I made Josh hold the baby rat. Josh was terrified of it. I lied to him and said it didn't have teeth just to get him to hold it. After about two days of the rat and the snake co-habiting. We grew attached to the cute little guy and decide to take him out of the snake cage in the event that the snake changed his mind, we would be heart broken. So many stories have occurred with our lovely rat over the years. His name in Timbleton. He is the most amazing pet we have ever had. He is loving and well behaved. He never bites and gives kisses. When we were first married we would let him come out of his cage and play with Joce. At first she was scared but she grew very fond of him after time. They would chase each other around the room. Nothing was funnier than a tiny rat chasing a dog. Joce would go and sit at the bottom of his cage and cry because she wanted to play with him all the time. It was at this time we decided she needed a real friend and we got the other dogs. Then we decided Timbleton was lonely and we got another rat to me his friend. Her name was Snowball and she was nothing like Timbleton. 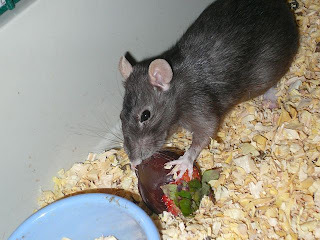 She got sick like most rats do and she died about a year later. It was sad but the truth is Timbleton prefers people. When we moved to Maryland we didn't think Timbleton would survive the move so we gave him to a friend. I was afraid to call and ask how he was because Rats only tend to live a couple of years and I couldn't bare the news of him passing. Well we moved back from Maryland and this friend said we could have the Rat back. At first I was like no thanks! I have a new baby, a horse, and 3 dogs. I didn't need one more animal to take care of. I am so glad we got him back. He is still pretty awesome. We call him Hudini now. He has discovered how to escape any cage we put him in. It is totally fine though because he always come when we call him. The first night he got out (he lives in the storage room) he made a home on the floor in dirty laundry and opened some bags of cereal and carried each piece to his new home. When I found him in the morning he was exhausted and sleeping in my coat. Another night Josh and I were lying in bed and I kept hearing this noise, Josh said it was just Joce snoring. But finally he heard it too and we went in the storage room and Timbleton was pushing his water bottle around the room. Now it's a regular occurence, his getting out. Last night the door was open a crack and the dogs were crying by the door with Timbleton staring through the crack at them. I Love him so much and I know he has already surpassed any life span expectations. We hope he is like the rats of nimph and will live forever. Aiden and Daddy went out to take care of Cori (the horse). I just had to get some pictures of Aiden in his adorable snow suit in the snow. The dogs were running around crazy and kept getting in my pictures. 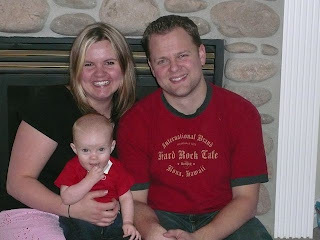 Which of course Aiden loved. He would rather watch them, than look at the camera.